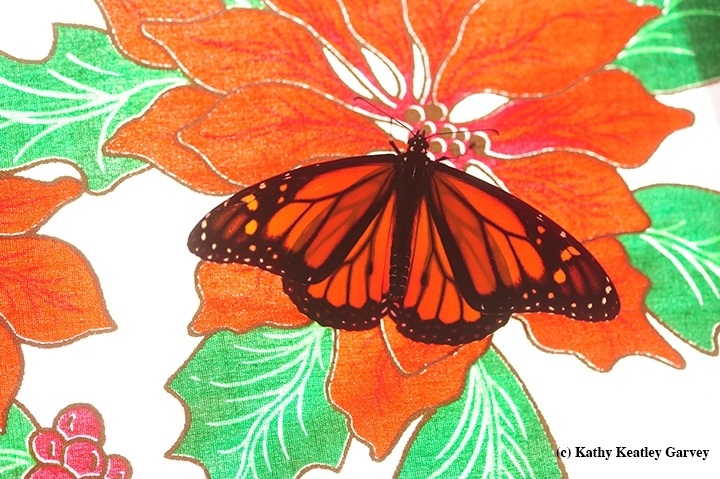 Merry Christmas has always been merry, but it's better with butterflies! Isn't everything better with butterflies? 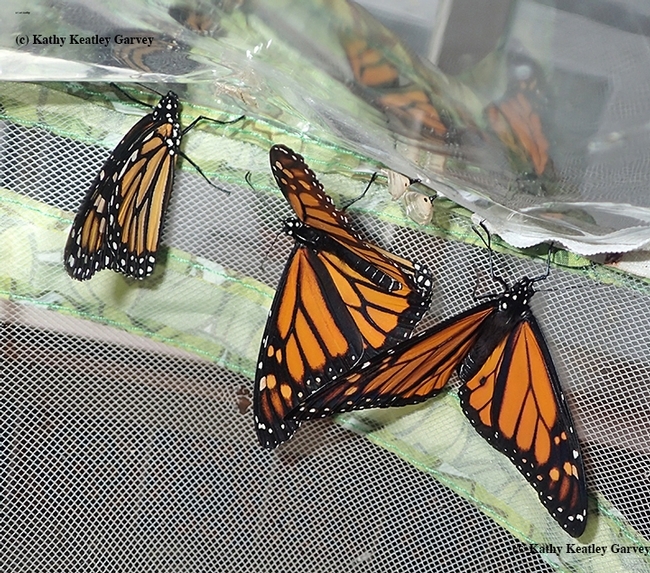 Last year, in our small-scale monarch rearing project here in Vacaville, Calif., we saw one monarch eclose on Saturday, Dec. 24, one on Sunday, Dec. 25, and one on Tuesday, Dec. 27. 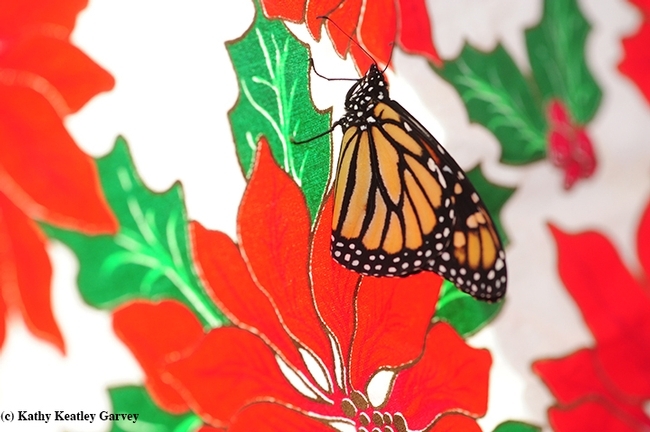 What's missing this Christmas: no monarch butterflies. In 2016 we reared and released 62 Danaus plexippus. This year, eight. We could blame it on predators, parasites, pesticides, loss of habitat, human errors, natural occurrences, climate change or MC (mysterious circumstances), but we won't. We do know this: eight is not enough. live in France and call it "papillon"
live in Italy and call it "palomma"
live in the Philippines and call it "paruparo"
live in Portugal and call it "borboleta"
live in Germany and call it “schmetterling"
live in Vietnam and call it "npau npaim"
Butterflies are the canaries in our coal mines. Their very presence indicates a healthy environment and healthy ecosystem and represent symbols of hope, love, joy, change, transformation, strength and endurance. They overcome the odds. We are part of those odds. 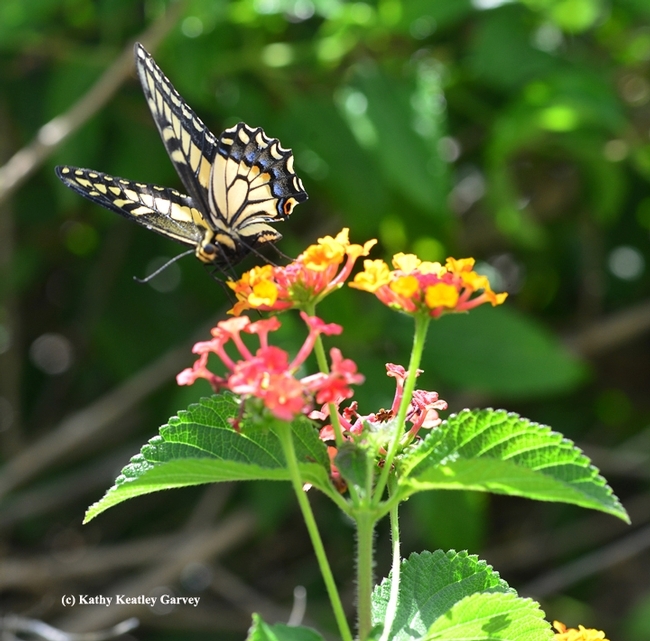 They are flowers with wings: flitting, fluttering and fluctuating flybys just out of our reach. Miracles of nature. Merry Christmas! And may the best of what's to come be filled with butterflies. The Beer-for-a-Butterfly contest is over. 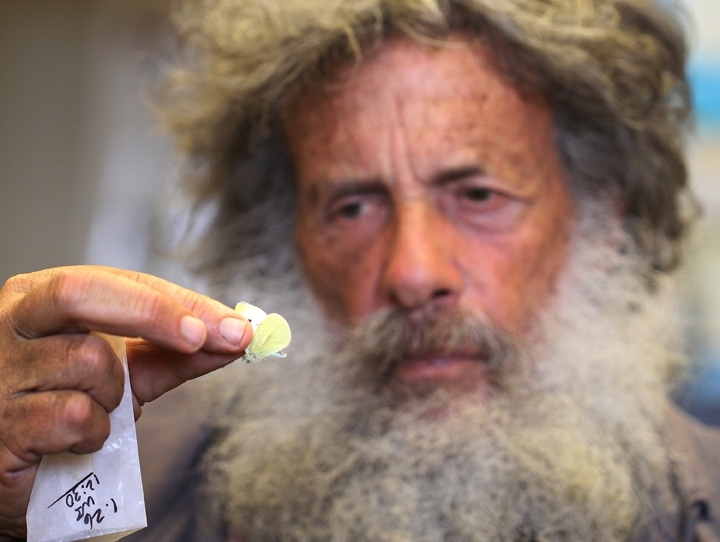 Shapiro, distinguished professor of evolution and ecology at the University of California, Davis, who sponsors the annual Beer-for-a-Butterfly Contest to collect scientific data, snagged the first cabbage white butterfly of the year at 12:30 p.m.. Monday, Jan. 26 in West Sacramento, Yolo County. “The cabbage white butterfly (Pieris rapae) finally came out today (Jan. 26),” he said. 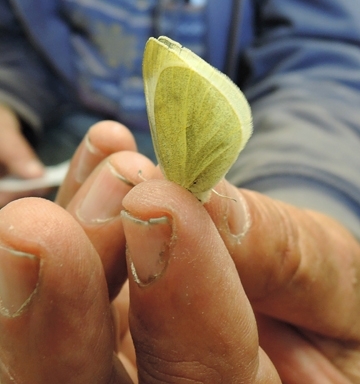 Although the first flight of the cabbage white has been as late as Feb. 22, it is emerging earlier and earlier as the regional climate has warmed, said Shapiro. “There have been only two occasions in the 21stcentury in which it has come out this late: Jan 26, 2006 and Jan 31, 2011. Ten minutes after collecting the cabbage white, a second species, the mourning cloak (Nymphalis antiopa) showed up. “It hibernates as an adult and is always an early flier, but this was its first record on the floor of the Sacramento Valley this year—it's been out about two weeks in the lower Coast Range,” Shapiro said. Five minutes later, at 12.45, a third species showed up: a male fiery skipper (Hylephila phyleus) that landed momentarily literally at Shapiro's feet. It was the earliest he's ever recorded. 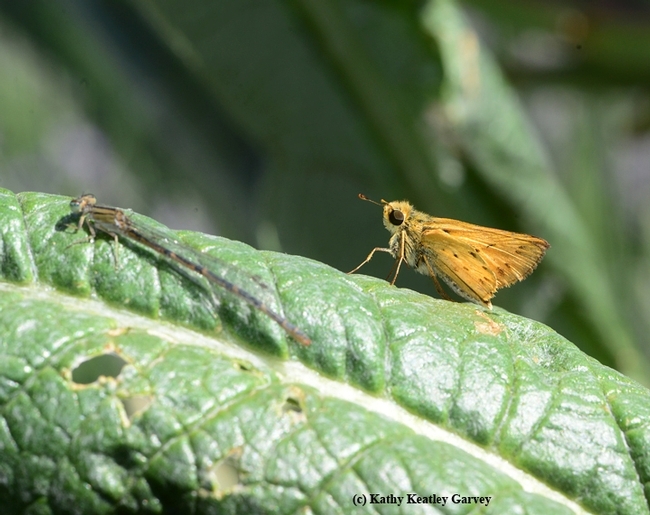 “This is a much more significant record than the others,” he said, explaining that the fiery skipper “normally is first recorded around here in March or even April. Last year it set a new early record in the Valley—Feb. 21, in Rancho Cordova, Sacramento County.—the only February Valley record in our 43-year database. It was last seen in 2014 on Dec. 1, also in Rancho Cordova. However, there are two January records at the Suisun Marsh, Solano County: Jan. 3, 1996 and Jan. 28, 2000. Of the fiery skipper, Shapiro noted: “The first was certainly a late carryover of the fall 1995 brood, which was still flying on Dec. 14. “ The species wasn't seen again until the start of the spring brood on March 31, 1996. The 2000 record is more ambiguous. The last Suisun sighting in 1999 was on Dec. 11 and the first spring sighting was very late, May 24, 2000. “The last fall-brood sighting of the fiery skipper was on Nov. 9, 2014, making it exceedingly unlikely that this was a late individual from that brood,” Shapiro said. Shapiro has won the contest every year except three. Graduate student Adam Porter defeated him in 1983; and graduate students Sherri Graves and Rick VanBuskirk each won in the late 1990s. The contest rules specify that it be an adult (no caterpillars or pupae and that it be captured outdoors. It must be live when delivered to the department office, 2320 Storer Hall, UC Davis. 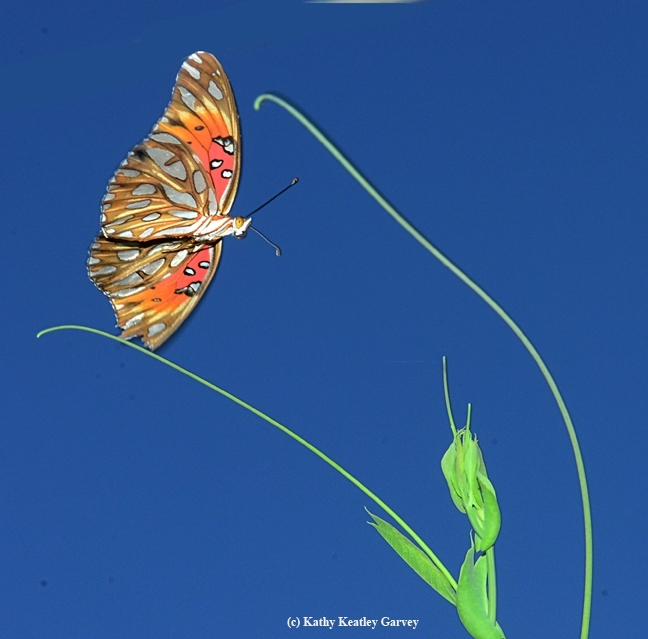 Shapiro has monitored central California's butterfly populations for 43 years and posts information on his website. There's something about seeing a butterfly that makes your eyes light up, your smile widen, and your feet feel like skipping. So when I was over at Kaiser Permanente in Vacaville last Tuesday, I rejoiced at seeing a magnificent anise swallowtail, Papilo zelicaon, fluttering around the lantana flower beds near the entrance. 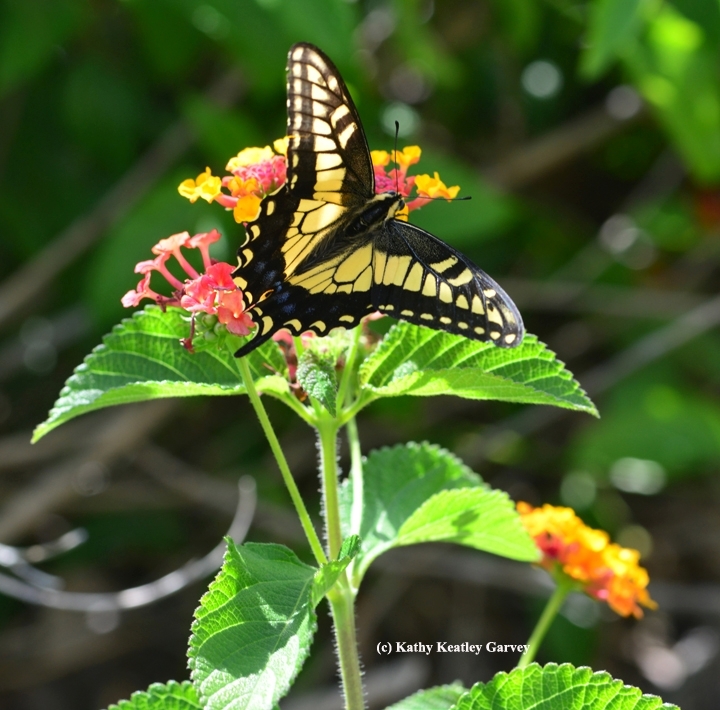 The butterfly flashed its brilliant yellow and black colors in the morning sun as it glided around the flower bed, touching down occasionally for a sip of nectar. Such a beautiful, awe-inspiring, glorious creature. So I did what comes naturally—I pulled the camera out of my bag—somewhat like pulling the rabbit out of a hat because you never know what kind of magic may--or may not--happen. Assuming my best "non-predator posture," I slowly trailed it from blossom to blossom, dropping down to capture its image. It was then that I noticed a woman sitting on a nearby bench, smiling, as she watched the photographer follow the butterfly. Half an hour later, I returned to the area only to observe a stricken look on the woman's face. “You have the last photo of that beautiful butterfly," she said. "A bird ate it." And right in front of the managed health care facility. 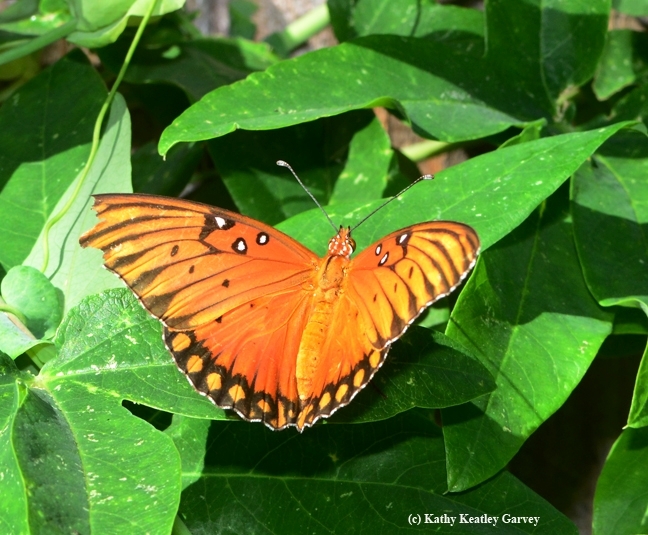 There's a good reason why lepidopterists call the Gulf Fritillary (Agraulis vanillae) "showy." Its bright orange-red wings, spangled iridescent silver on the underside, and a four-inch wingspan all point to "showy." The Gulf Frit is a tropical and subtropical butterfly with a range that extends from the southern United States all the way to central Argentina. Back in September of 2009, butterfly expert Art Shapiro, professor of evolution and ecology at the University of California, Davis, excitedly announced the re-appearance of the Gulf Frit the Sacramento metropolitan area after a four-decade absence, and in the Davis area after a 30-year absence. Yes, the Gulf Frits are back. Thankfully, they've returned to creating a nursery of sorts on our passionflower vine and their host plant (Passiflora). The eggs, caterpillars, chrysalids and adults are a delight to see. 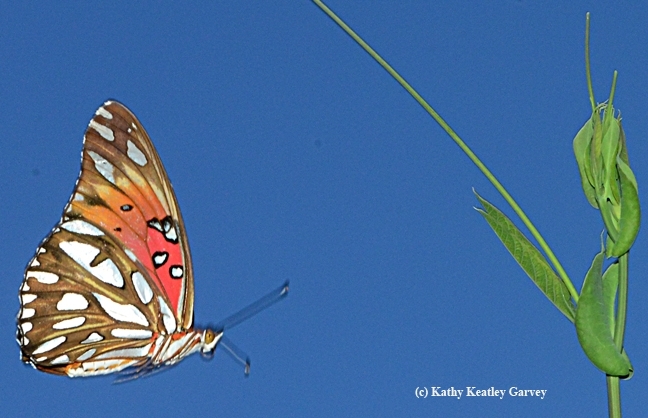 Today we captured several images of a Gulf Frit in flight. If you look closely, you'll see that part of her wing is missing. In the entomological world, we call that a "two-fer." Two insects in the same photo. Sunday morning we spotted a fiery skipper butterfly (Hylephila phyleus) on an artichoke leaf. 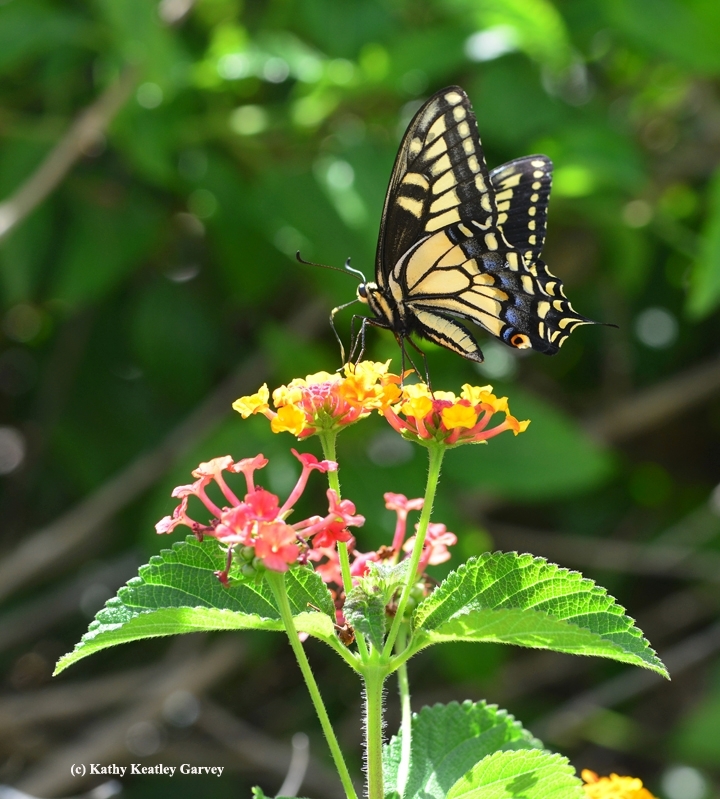 It was warming its flight muscles, maybe to flutter over to the lavender for a sip of nectar. Next to it--we almost missed it--was a damselfly, apparently doing the same thing. Or maybe it was waiting for an aphid or a gnat or ant to come along. They eat small, soft-bodied insects. 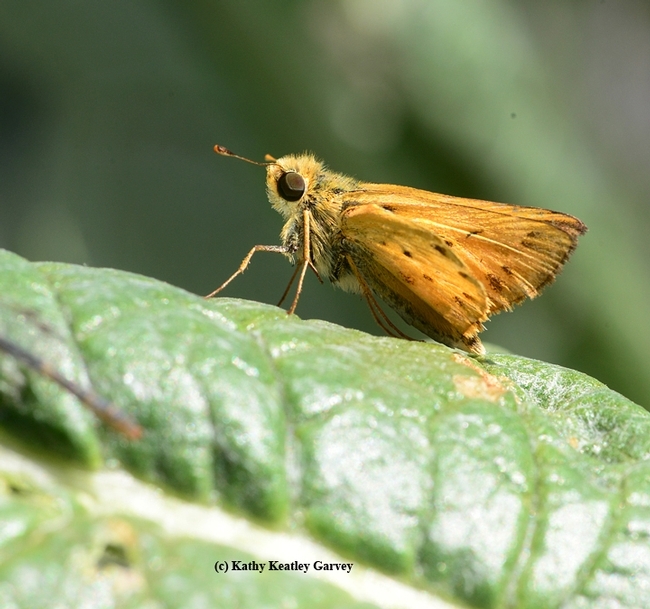 The skipper: a member of the family Hesperiidae, order Lepidoptera. The damselfly: a member of the suborder Zygoptera, order Odonata. Two entirely different orders, but both belonging to the class Insecta. And sharing an artichoke leaf on a Sunday morning.